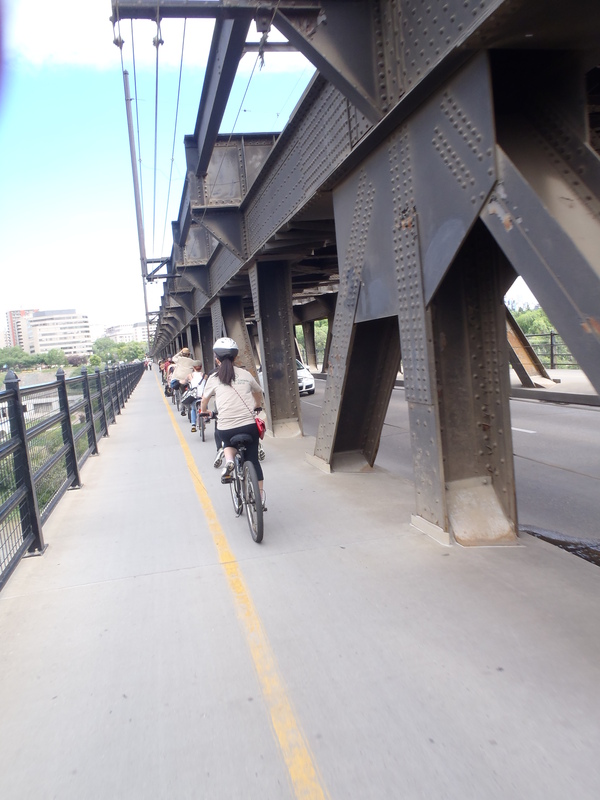 June was bike month in Edmonton and there were a host of events, a very few of which I took the time to check out. 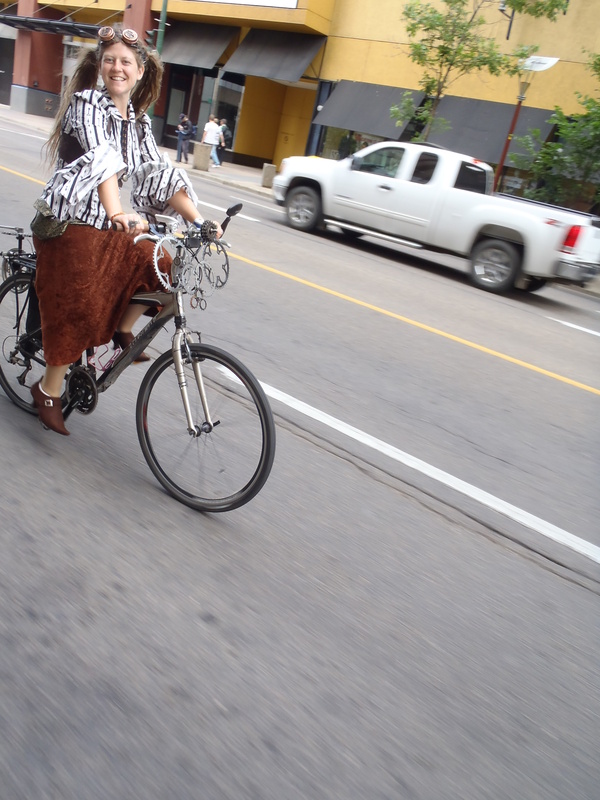 One that I could not let pass me by unattended was the first Edmonton Steampunk Bicycle Ride. 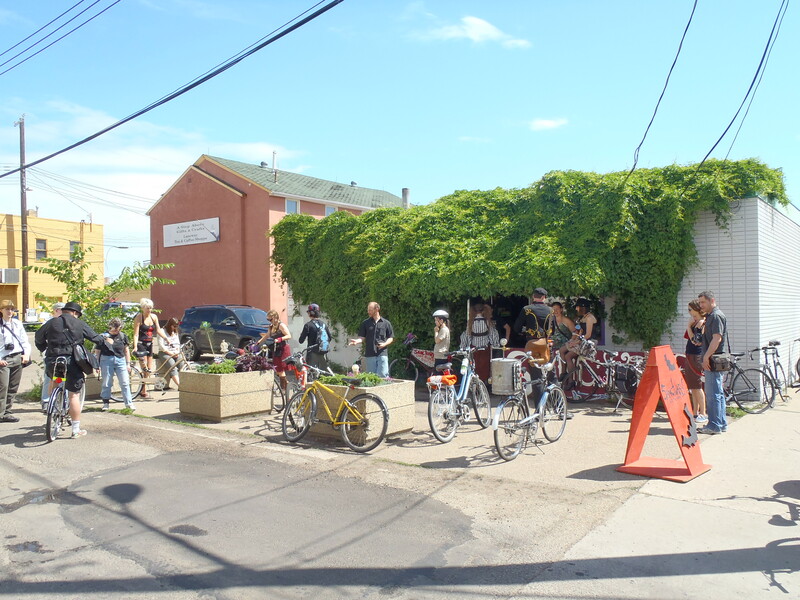 I was aware of the ride well in advance from the blog of one the organizers, Bikewriter, and for a change I did not leave my preparations until the VERY last minute. 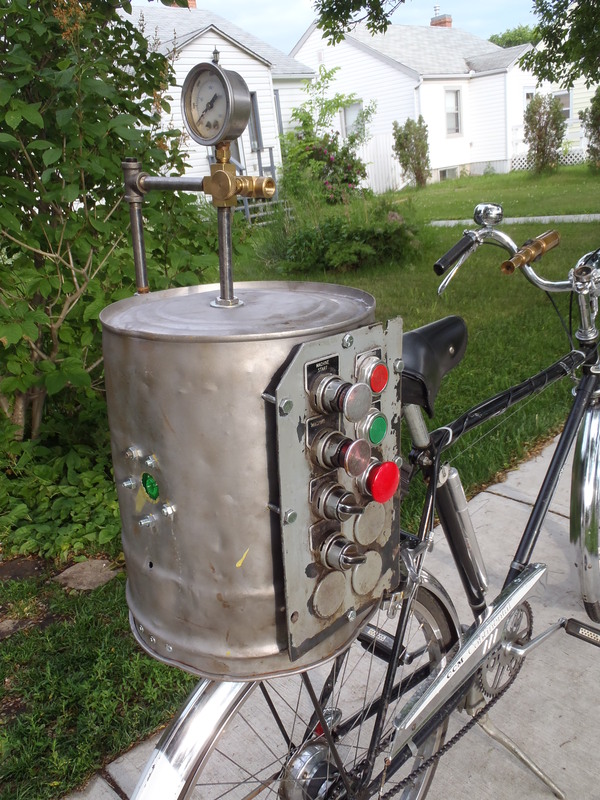 Steampunk is a sub-genre of science fiction that imagines a setting where steam power co-exists with fantastical technologies. Typically it is set in the actual age of steam power and uses styles and imagery of the time. Picture lots of wood, brass and leather. 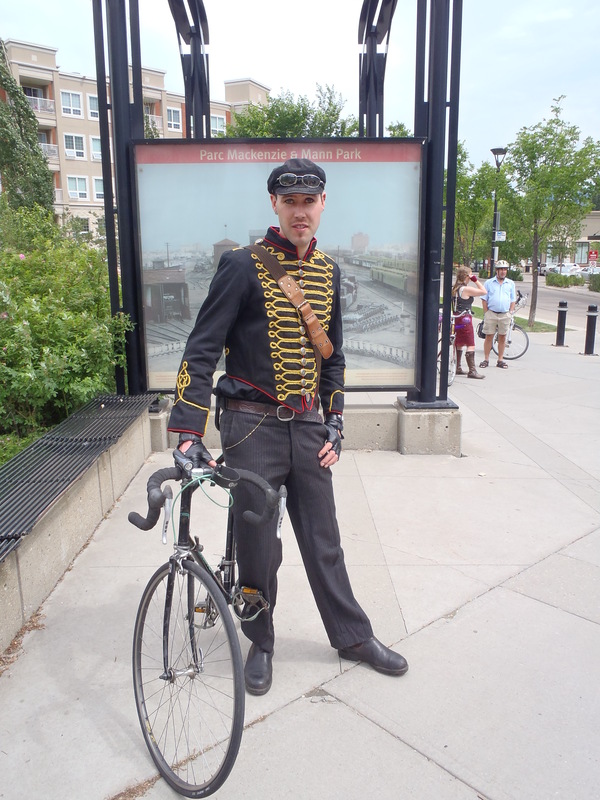 The whole steampunk thing has gained a lot of momentum in pop culture lately so the time was right for an Edmonton costumed bike ride. 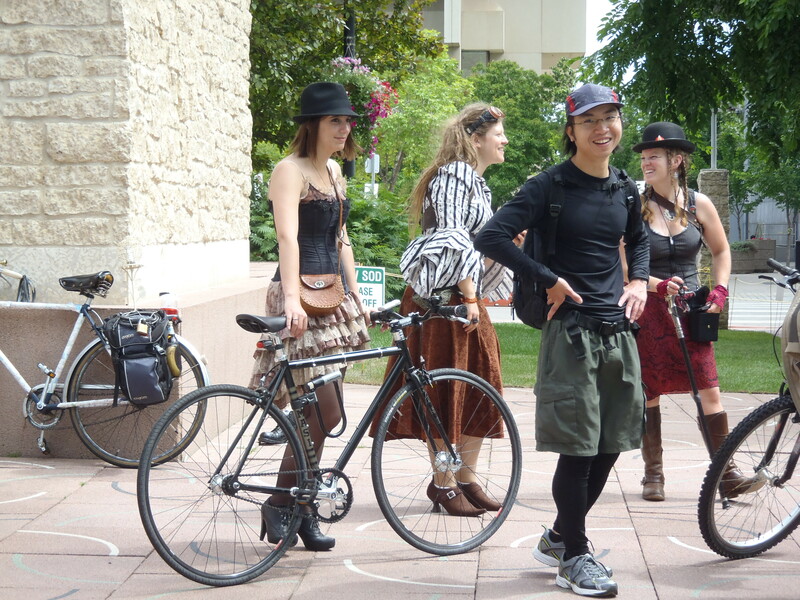 At my age I don’t think I could seriously get involved in the local steampunk scene but as a lifelong SF buff I was totally into this bike ride. I’d like to thank Jackie and Adrian for coming up with the idea and organizing the ride. They did a great job and I hear that it will likely be an annual event! If you want to see more pictures from the ride you can check out my set of photos on my Flickr page. My bike: CCM Continental 3-Speed with steam assist and navigational aids. 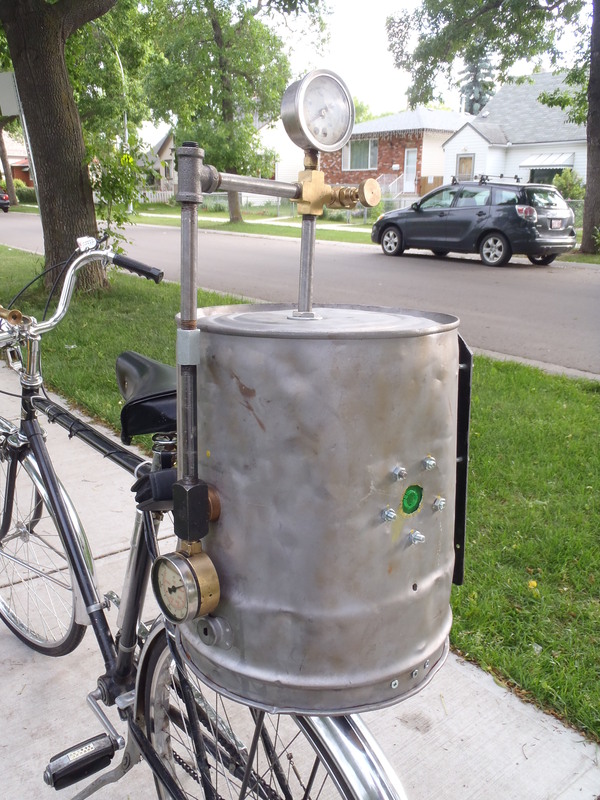 The steam engine pressure vessel is made from a bucket I sandblasted. I borrowed the control panel and gauges from a junk pile at work. The little window in the back was lit by a blinking bike light that I installed inside. It didn’t hold up so well to riding and kept falling out of place. 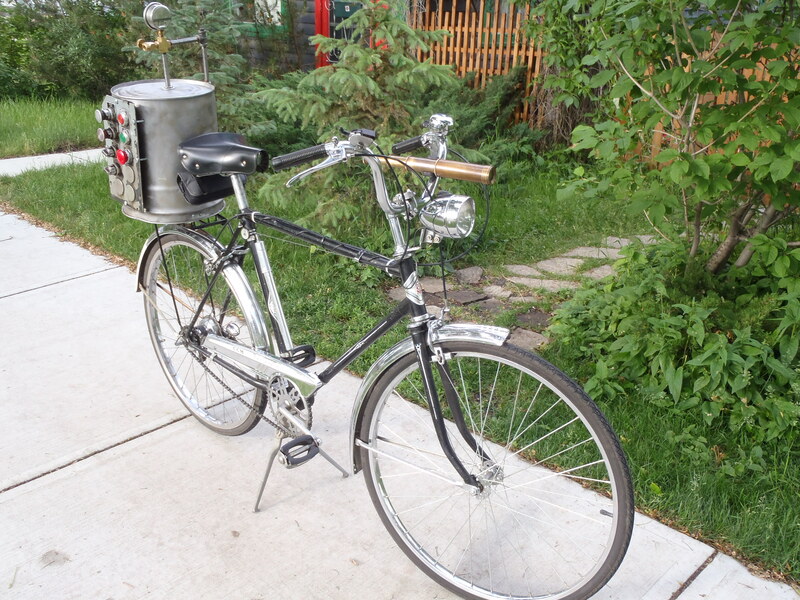 It did work when the bike was stationary, though. The green lens is the back of a CD jewel case. Navigational aids: Spyglass and compass. 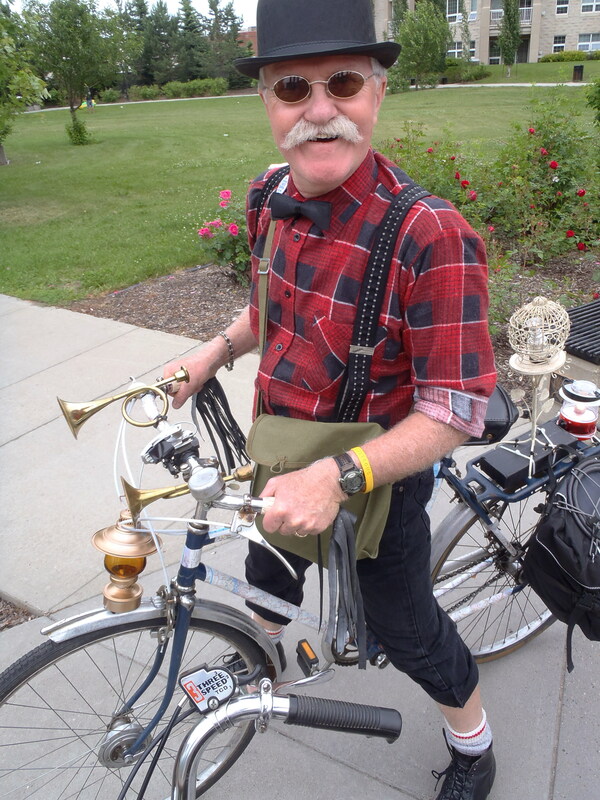 With steampunk you just can’t have too much brass, I think. 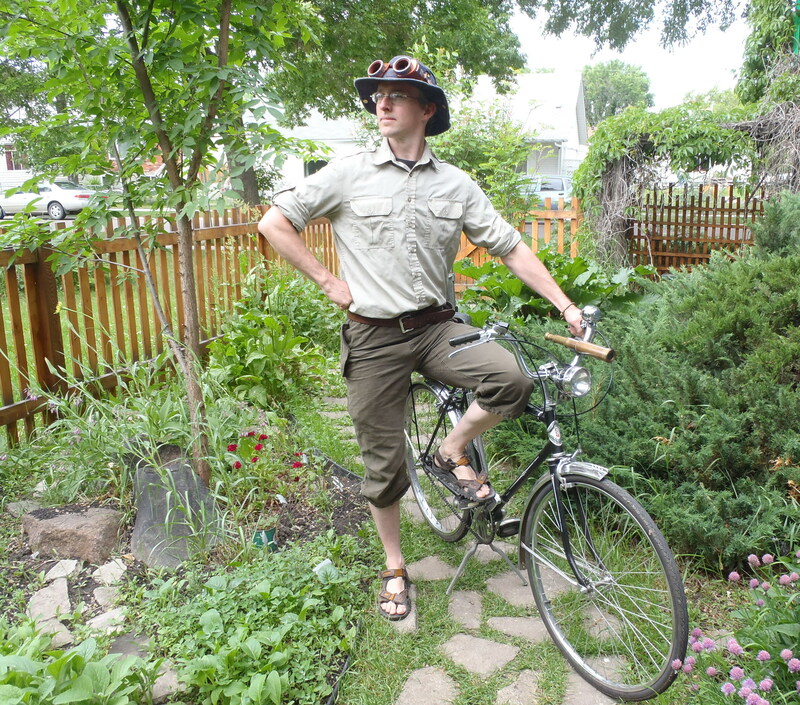 Goggles seem to be an essential steampunk accessory. 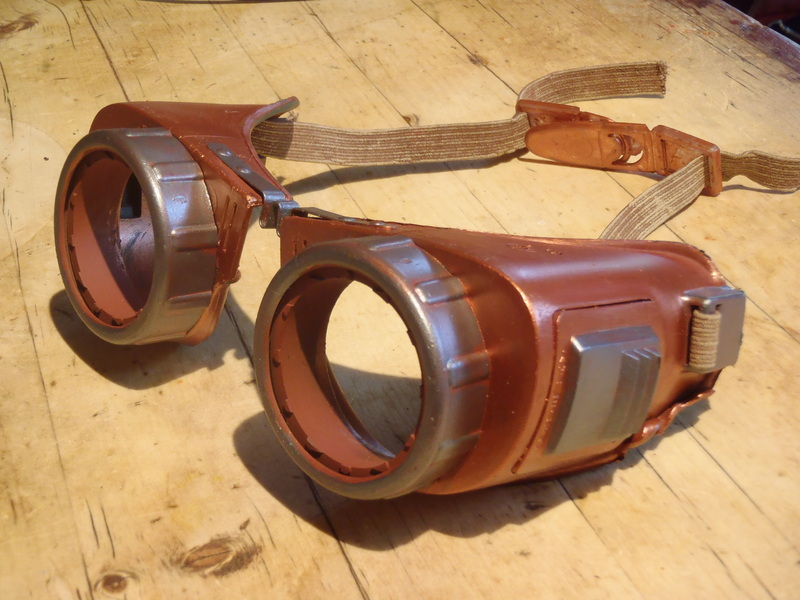 I removed the lenses from this set of welding goggles and my wife helped out by painting them. The ride starting point, Sanctuary Curio Shoppe, purveyors of Steampunk items and much more. Sanctuary also donated a number of prizes to be awarded at the end of the ride. 13 riders showed up as well a handful of interested onlookers. One of our fearless leaders. Lottsa steampunk style here, and maybe just a little bit of Clockwork Orange. 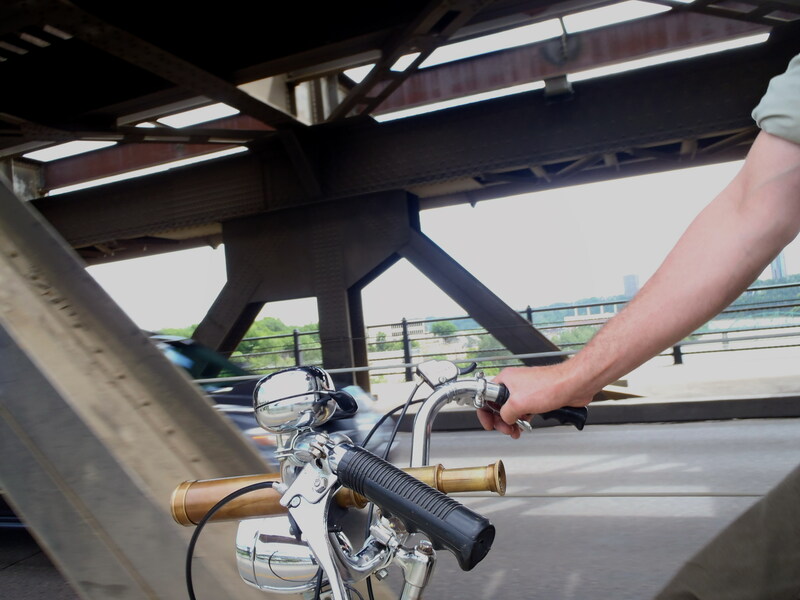 Crossing the High Level bridge. Built in 1913 it just doesn’t get any more steam-enginey than that in Edmonton. Maybe we should have stopped for some photos. We stopped at Churchill Square for a while to check out The Works art festival that was going on. 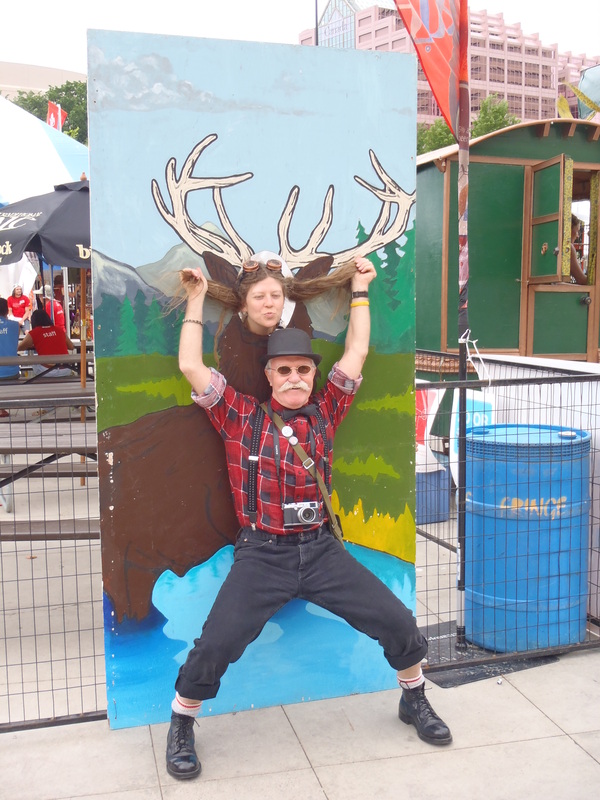 We attracted some attention from the festival goers, some of them believing us to be performers at the event. 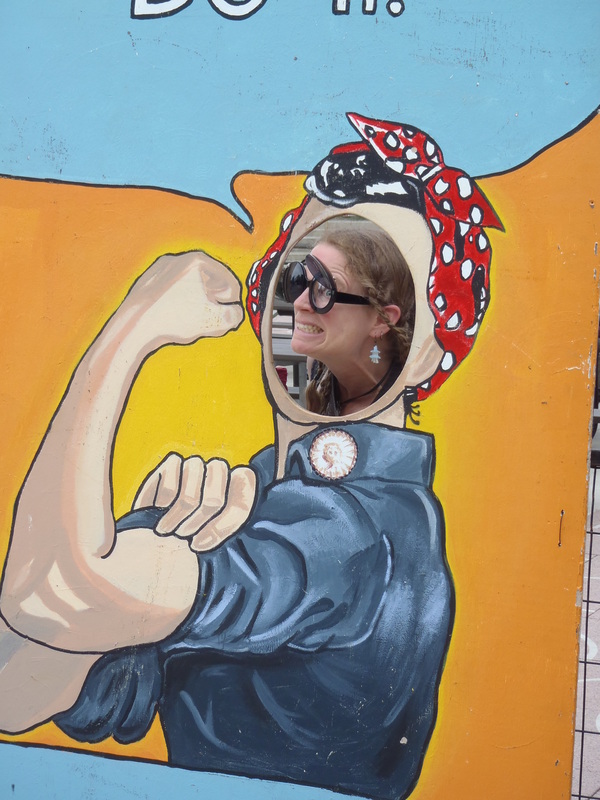 There was a little bit of goofing around. 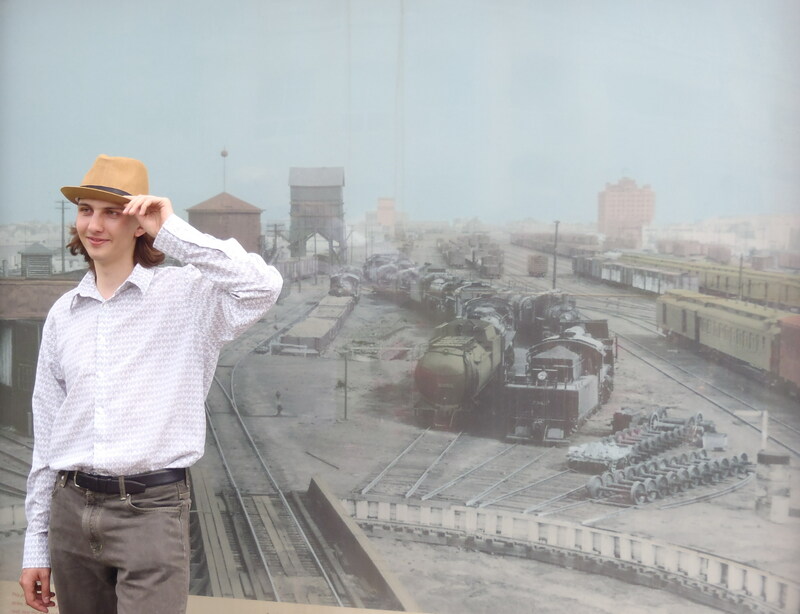 Later, we stopped at a little park with some historical pictures of railyards and such. The big sign was almost as good as a green screen! 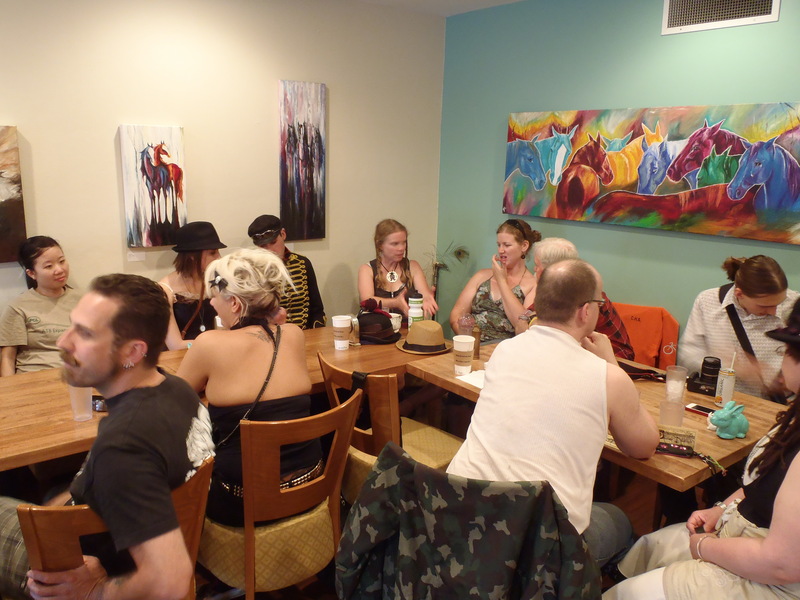 The ride ended (just before the rain started falling) at The Clever Rabbit with food, drink and prizes for the riders. 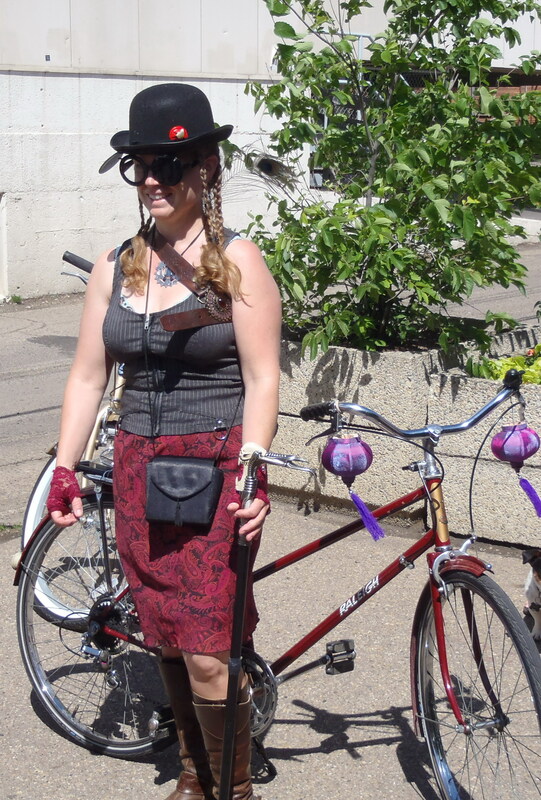 This entry was posted in Cycling and tagged Bicycle, Bike, cycling, Edmonton, steampunk by tuckamoredew. Bookmark the permalink. That’s really AWESOME! We need to have a SP ride around here. 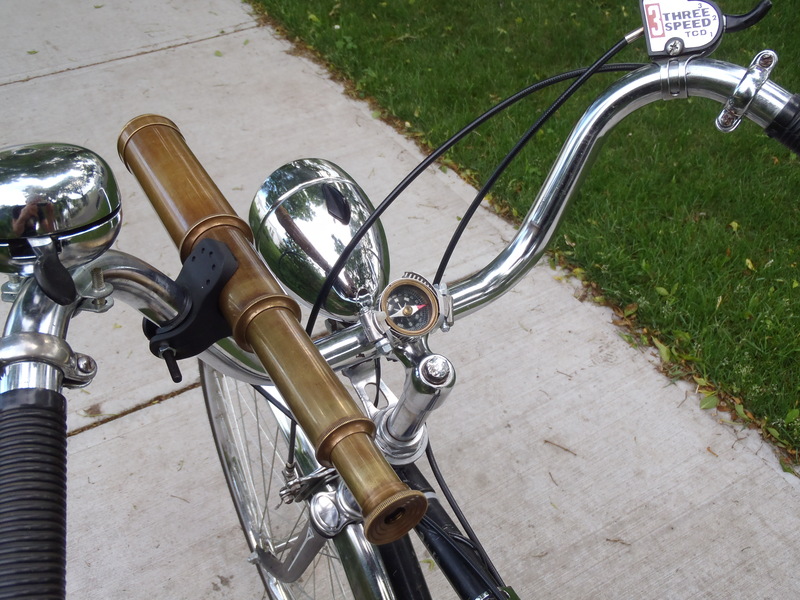 So next year you Steampunk the front light? Good job.